Students with Inattentive ADHD struggle at School. Social and academic problems can make kids with Inattentive ADHD perform poorly and dread the classroom. 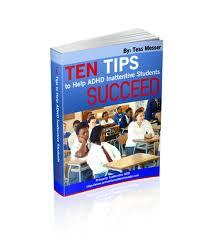 This book contains ten tips for parents of and students with with ADHD Inattentive type of ADHD that will enable them to have more success at school and in the classroom.